The tips on this page are about food preparation. There are things you can do to make your meals more nutritious and attractive. 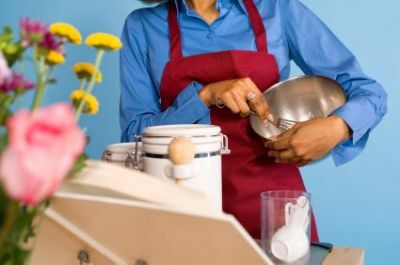 Many of these tips are things that used to be passed down from mother to daughter, or taught in "Home Economics" classes, but since cooking is becoming something of a lost art, you may not know about them yet. Keep in mind that the tips found here are ones that I know for sure are useful, because I use them myself! You can make your potato salad, macaroni salad or even Waldorf salad healthier by replacing part of the mayonnaise with plain, low-fat yogurt. (This also helps if you are short of mayo!) This will add protein and other nutrients, while at the same time reducing the amount of fat in your salad. The amount you replace is up to you, and depends on your taste preference. Waldorf salad in particular is very good made with all yogurt instead of mayonnaise. In order to reduce the amount of toxins that you are taking into your body, it is important that you wash your fruits and vegetables before you eat them. This process should involve more than merely running them under the faucet for a quick splash. Use some type of veggie wash or other product that is non-toxic, and keep it in a spray bottle by your sink. If you have time, soak your fruits and vegetable for a few minutes in a solution of cold water and the non-toxic wash. Please don’t use dish soap or other non-edible detergent to do this. They can be toxic and will probably make you sick if any residue is left on the produce. Washing your fruits and vegetables in this way will also help remove the waxes that are used to enhance the look of the produce. 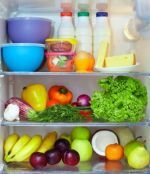 It is recommended that you do this right before you are going to use the produce, or that you thoroughly dry the produce before storing it, since wet produce will spoil very quickly. If you like to cook with herbs, you can have a small, indoor herb garden for that purpose. Just take a small oblong planter and fill it with fresh soil. Get some seeds of the herbs you like (my herb garden has parsley, sage, basil and oregano), and plant them and water them. Once the plants leaf out you can snip them, wash them, and add them to your favorite recipes. There is something special about using fresh herbs in your cooking. You can blend cottage cheese in your blender with some milk and it will take on a smooth texture. It can then be used in place of sour cream in recipes; this will increase the protein in your recipe as well as reduce the amount of fat. Recently, a friend called me to ask for my whole grain bread recipe, because the one she was using required her to “proof” (let raise and punch down) the dough twice. I explained to her that the extra proofing was to make the bread lighter in texture. You can proof your bread dough several times before you shape it, to make it lighter. Sweet potatoes are a colorful and nutritious addition to any meal. They are loaded with Vitamin A and fiber. One way to prepare sweet potatoes that we really like, is to make sweet potato fries. This is really a misnomer since they are really baked not fried, but “fries” sounds so much better than “bakes". To make them, preheat oven to 400 degrees, and wash and scrub the skins of the sweet potatoes. Then cut them into wedges-- at least 8 per potato. Put them in a bowl and sprinkle with 1 tablespoon of olive oil for every two potatoes. Add some nice Celtic sea salt, or other good quality salt, and mix. Place on a cookie sheet and bake for about 20 minutes. Serve immediately with your favorite burger. Recipe and Cooking Tip #7: Alligator pears? Did you know that avocados, formerly known as "alligator pears", are an excellent source of monounsaturated fat(the good fat)? They are also rich in fiber and vitamins and minerals such as Vitamin A, folic acid and potassium. Try mashing a fresh avocado with some sea salt and lemon juice for a great dip for veggies, or put slices of this “buttery” fruit on a sandwich or chunks of it in your favorite garden salad. Delicious! Recipe and Cooking Tip #8: Did your cream soup curdle? Despite your best efforts, you will sometimes run into the problem of "curdling" when you make cream soups, such as homemade potato soup or homemade cream of tomato soup. This can happen if the mixture gets too hot (boils) and, although the soup will still taste fine, it does not look as appealing as it could. A remedy for this problem is to let the soup cool(for safety's sake) and then run it through the blender. I recently made fresh cream of tomato soup with some tomatoes from my organic garden, and although I was careful, the soup curdled. Blending the soup, after it cooled, restored its creamy texture. Delicious! If you ever make tomato soup or spaghetti sauce or any other kind of sauce using FRESH tomatoes, you can reduce the acidity of the sauce and smooth out the flavor by adding a small amount of baking soda to the hot cooked tomatoes. For every six tomatoes, add about 1/4 teaspoon of baking soda,and wait until the fizzing stops before continuing. Whenever you use eggs in cookies, cakes, brownies or other baked goods, you will get a better finished result if you warm up the eggs before adding them to the batter. To do this, simply take the number of eggs needed, wash them with your veggie wash, and put them in a bowl of hot water for a few minutes before breaking them and adding them to your batter. This technique will keep the batter the proper temperature for smooth blending of the ingredients. WARNING: BE SURE TO DISCARD WATER AND USE EGGS ONLY IN THOROUGHLY BAKED FOODS. ALWAYS WASH YOUR HANDS AFTER HANDLING RAW EGGS. NEVER EAT RAW DOUGH, SINCE IT COULD BE CONTAMINATED WITH SALMONELLA! Click here for more information on raw eggs and salmonella. If you make homemade bread on a regular basis, you might want to consider changing its shape. Rather than putting it in conventional loaf pans, consider making the loaves round instead. After the dough has raised, divide it into two pieces and after patting them into a round shape, place them on a greased cookie sheet to raise. This saves time compared to greasing loaf pans and then removing the bread from the pan after it is baked. It also gives your bread a "gourmet" quality, since specialty breads are often made in round loaves. For an added decorative touch, you can carefully slash the tops of the raised loaves with a sharp knife, right before putting them in the oven. Recipe and Cooking Tip #12: Are you measuring your flour correctly? This may sound like a silly question, but, believe it or not, the quality of your baked goods will be affected by how you measure your flour. Recipes, especially baking recipes, are based on a standardized way to measure called the "dipping" method. The way this works is that you dip a scoop into your canister of flour and pour it into your measuring cup. This is important, because flour is light and packs easily. If you scoop using the measuring cup, the flour will pack into the cup and your baked product will be heavier than intended. I once had a family visiting and when I served oatmeal for breakfast, the husband made of point of taking me aside and saying that it was the best oatmeal he had ever had. I was surprised since oatmeal seems like a simple dish to prepare. Here are some tips that will make your oatmeal a more popular breakfast choice. The most important tip is don't stir it! Once you bring the water to a boil and add the oatmeal, reduce the heat to medium and just let it cook and soak up the water. If you stir it too much it will turn into library paste! Be sure to add some good quality salt, about a half-teaspoon for every 3 cups of water, depending on your taste. The best oatmeal is made with old-fashioned rolled oats or steel-cut oats. Using these types of oatmeal will create texture and flavor that you don't get with "quick" versions. Also, for your health's sake, skip the pre-sugared versions and don't add sugar at the table. Instead add some berries or a chopped up apple with some raw walnut pieces and a bit of cinnamon, if you don't like it plain. Scrambled eggs can be a tasty breakfast dish if they are prepared properly. Here are some tips to make your scrambled eggs a taste treat. --For a change of pace, rather than beating them ahead of time, break the eggs into an oiled skillet and when they begin to thicken, gently scramble them with a spatula just enough to break up the yolks. --Don't overcook. When eggs have just lost their liquid quality, but are still soft, remove from heat and cover with a lid for a few minutes to let them gently finish cooking while you make the toast. --For an attractive meal, move eggs to one side of pan and add chunks of avocado and tomato, lightly salted with a good quality salt. (You can also add some black olives slices, if desired. )Cover pan and allow vegetables to warm up a bit. Serve with sweet potato wedges, whole grain toast and fresh salsa, if desired. --Another way to prepare scrambled eggs is to break them into a bowl and add a few tablespoons of Parmesan cheese. Gently mix (or whip if you like your eggs more fluffy) until cheese is blended and then pour into an oiled pan and cook until just set. Click here to go from Recipe and Cooking Tips to Recipes page.